Note: The designation Director has been used in various industries but I am specifically talking about films and theatre. Probably like any small town kid, my acting and directing journey has started almost at the same time. I had, however, shifted my focus completely on acting. But from the last one year, I am back as an actor and director in different projects. 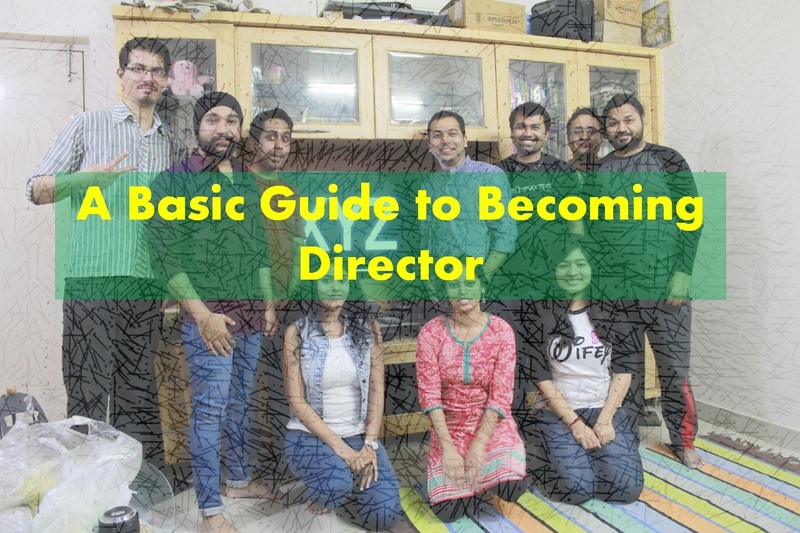 Anyway, you will know more about it below in points where I am going to elaborate on what anyone must follow to become a director. There are three stages of filmmaking: pre-production, shooting, and post-production. Pre-production includes script writing and planning of the entire film. In shooting, you must execute the plan and capture each moment of the story according to the storyboard (the picture version of the script) with help of your entire crew and actors. Post-production includes the sound editing, dubbing, music, video edit and colour correction of the film. Sounds difficult? Let’s mull over the below points and come back to the question. Filmmaking is a vast and lengthy process that includes all different departments to work together as a team for a vision set (generally) by a director. Since you are the conceiver and responsible for the vision, you must know and understand the technique and workability of each department such as story writing, acting, editing, cinematography, production, art direction, visual, light department, music, choreography etc. That said, you don’t really have to master all or any of it. On a short level like for short films, it’s necessary to at least understand the story writing, cinematography, editing, and acting. Moreover, you will have good experience to foresee any hiccups. I have explained it in details in point 4. Filmmaking is a visual storytelling medium. Whether or not, you have written the script you must understand the story and set a vision in your mind with the right emotion. The script could be anything but it’s your imagination that ultimately going to be on the screen. A dramatic script can become comical, a comical script can become tragic and a tragic story can become action-packed surreal drama. It’s important to deeply analyse your script and turn it into your vision at the pre-production stage. The idea is to be confident about the story so that someone asks any question regarding the script you always have a good answer for it. For a feature-length or large-scale film, you will generally have to work with lots of department. But on a short scale, you must be comfortable with the cinematography department, editing team and actors. Cinematographers are going to give a picture to your vision. Editors are going to craft it to enhance the work of the cinematographers. Actors are going to play characters who will emote the story for you. The more you work with them the better their understanding will be about the script and your vision. Cinematographers, actors, and editors must be included in the pre-production stage in the respective order. This goes into the pre-production stage. As soon as you finished with a screenplay and understood how you want it on your screen, you must begin planning with a set of actions. The planning includes story-boarding, shooting location, selection cast (actors) & crew (cinematographer, editor, musician, sound designer, production manager) and timing for each part as well as the budget of the entire film. Remember, a slight change or miss in the planning can make the whole ship distracted and it will need a lot of effort to put it back on the track later. Be careful about it. See, that’s why working with each department is important, you will be experienced enough to take a careful measure from the very beginning. From the very beginning, you must know your constraints; it could be a certain location, visual effects, music variations, lights, camera or anything. The important thing is to have a check on these constraints and see if you can overcome these or not. If not, you must either find an alternative or change the script accordingly. Perhaps, you might have understood that these clarifications and identifications must be completed on the pre-production stage. The basic definition of a leader says that a person who inspires and motivates others to work towards a single is called a leader. Filmmaking is a collaborative process. While the director, as a leader, must convey his/her idea to the team, he must not force upon it to them. There must be a sense of respect and freedom of expression (not being political) maintained. There might be several points you, as a director, may have a clash with the cinematographer, editor or actors. These can happen due to creative differences or ego-clash. In any of the case, the director must be inclusive in his/her communication and should not build a shield around him/her. If you want to become a director then you must have heard this advice a million times – make movies. Do not wait for the golden opportunities or some calling or right time. There is no right time. In my previous experience, I have worked in short films as a production member, scriptwriting team, actors and in theatre, almost all departments. My first film, as a director, which was started back in December 2013 is not finished yet. However, I released a short film as a debut director in July 2018. You can watch it, if you want it. But, I hope that I have given enough points to inform and, probably, encourage you to become a director. If at all, you have any doubts regarding any of the department of filmmaking, you can ask me in the comment section or email me at randomsimiletalkies@gmail.com or call +91-8095876104.